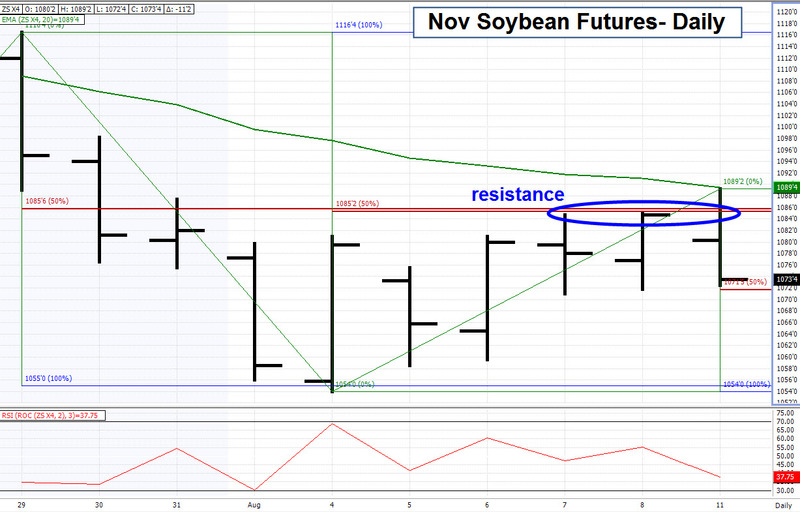 The soybean futures rallied about 30 cents last week, closing on the weekly highs on Friday. The rally pushed up to a significant Fibonacci retracement level and set the stage for a trade opportunity for Monday. The rally in November soybeans pushed the market up to resistance at 1085-2, a 50% retracement of the selloff from the 29 July high to last week’s low. As I’ve written before, these 50% retracement levels are often good reference prices, allowing us to see if a market move is likely to continue of fail and reverse. 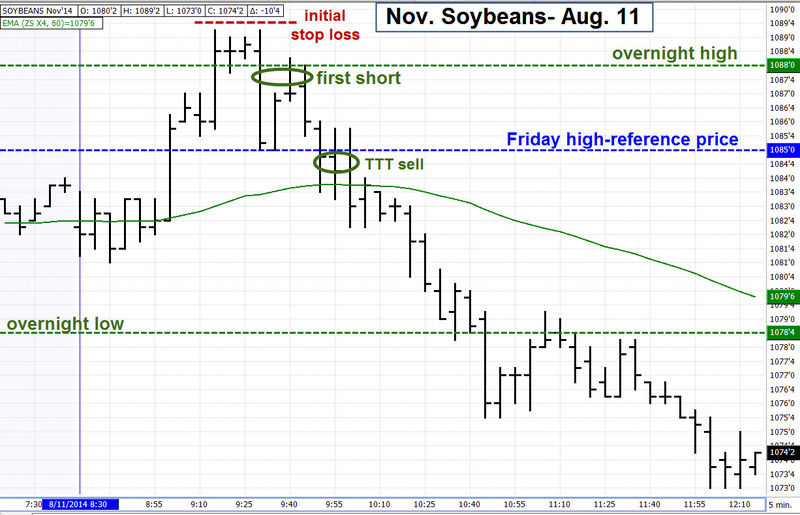 Sunday night saw an advance in Nov. beans as they made a session high to 1088-0. This gave us two levels to watch for Monday’s day session. We could watch the market on a move back above the overnight high of 1088-0 and to see when if it moved back below Friday’s high of 1085-0 (our original reference price). The 8:30 AM open was at 1082-0. By 9:15 it made a new session high of 1089-2 and then made ca double top there about 20 minutes later. The drop back below 1088-0 was the first setup for a short sale. The first break held at Friday’s low of 1085-0 and a bounce followed. A subsequent move below 1085-0 came around 9:50; this was the “official” TTT short entry. For either entry we could use a stop loss above the session high of 1089-2. The selloff caught on and by 10:35 it traded down to the overnight low of 1078-4; the first spot to consider taking profits. This area was taking out pretty quickly, and as patient (we try to be) TTT traders, we could stay short, with Friday’s low of 1071-6 as the next downside target. IT MAY NOT BE POSSIBLE TO LIMIT LOSSES TO THE EXACT LOSS LIMIT DEPENDING UPON MARKET CONDITIONS AND THE POSSIBILITY OF LIMIT MOVES.